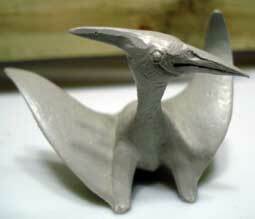 Toy Pteranodon, ca. 1962, from the Marx Company. To paraphrase Dr. Robert T. Bakker in The Dinosaur Heresies: I remember the first time the thought struck me! There’s something very wrong with that toy Pteranodon. It was a Marx toy (Fig. 1) with big, floppy wings that could NOT have been folded away. The wings extended, like bat wings, to the hind limbs, and so had a very deep chord, a shape still in favor by most pterosaur workers. Even as a kid I knew birds and bats could fold their wings close to their bodies, as compact as possible. The Marx Pteranodon looked to be incapable of that. 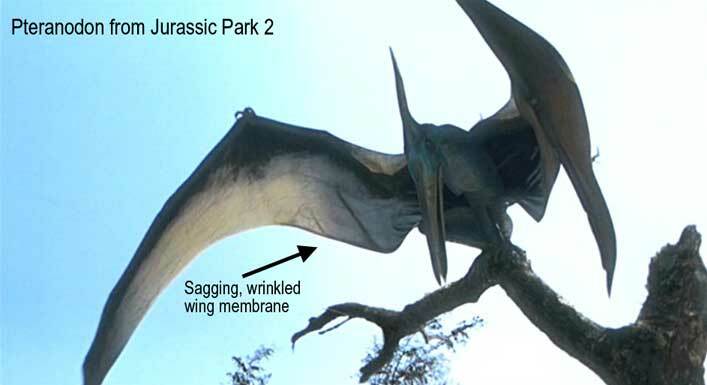 The pterosaurs in the Jurassic Park series suffered from the same deep-chord malady (Fig. 2). Figure 2. The deep chord wing model produces a "sagging blanket" wing membrane whenever the wing is folded. That is NOT reflected in known fossils. Figure 3. 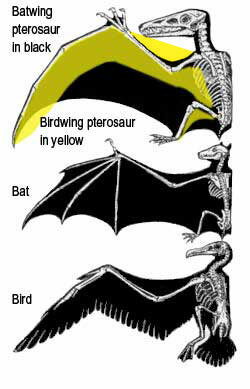 Comparing pterosaurs, bats and birds. Wings made pterosaurs the first vertebrates to achieve powered flight, but the shape of those wings has been argued about for decades. Most experts (Unwin and Bakhurina 1994; Elgin, Hone and Frey 2011, for instance) follow the traditional bat-wing model (Figure 3), with a deep trailing edge curving back to attach at the ankle. Such a wing is incapable of being folded away without sagging. Another wing model emerged when Bennett (1987) reported on bicondylar and fused tail bones in Pteranodon that could move only up and down. He proposed a wing model in which trailing edge attached to the tail tip and so could be lifted and depressed like an airplane elevator (Figure 4). 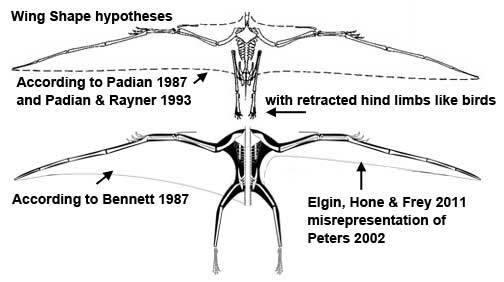 At about the same time, Padian (1987) and Padian and Rayner (1993) argued against the bat-wing model in favor of a more bird-style model by attaching the trailing edge to the middle or posterior of the pelvis (Figure 4) with hind legs tucked in. 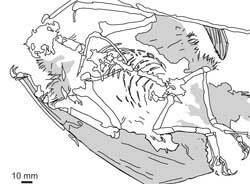 Ironically, while arguing against the bat-wing paradigm, Padian and Rayner (1993) fell sway to its influence and invented more wing tissue aft of the elbow in their reconstruction than they showed in various fossils (see below). Figure 4. Various "narrow chord" wing membrane proposals, but note that all, except Peters (2002) include a large amount of material aft of the elbows, as in the bat-wing model. Here’s the evidence for the traditional bat-wing model. Figure 5. Darkwing Rhamphorhynchus traced by Elgin, Hone and Frey (2011). The displaced humerus is highlighted in yellow. Note the trailing edge of the wing is directed toward the elbow. 1. The “darkwing” Rhamphorhynchus was traced “as is” with a continuous tone deemed to represent a wing membrane that attached at mid thigh (Figure 5). Note that the left humerus was disarticulated and displaced posteriorly. Even so, the wing membrane trailing edge was directed precisely at the elbow, as in the Peters (2002) model. The strip of soft tissue extending down the thigh was on a level below the wing membrane, not continuous with it. 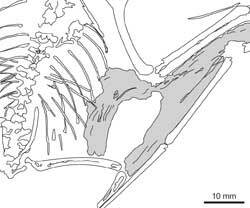 The Zittel wing specimen of Rhamphorhynchus was not used by Elgin, Hone and Frey (2011) despite preserving a exquisite wing membrane that was extremely short at the elbow, supporting the Peters (2002) model. Figure 6. 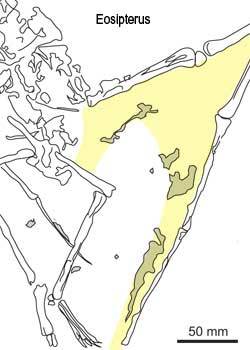 This Elgin, Hone and Frey (2011) tracing did not distinguish between hairs and wing membranes. It also did not include data from the counterplate. 2. The holotype Jeholopterus specimen (Figure 6) was traced only from the plate with no distinction made between the long pycnofibers (hairs) and wing membrane. An alternative reconstruction is offered here in which the counterplate is also employed and a more precise tracing of the soft tissues are documented separating the narrow wings from the long pycnofibers. Figure 7. Elgin, Hone and Frey excused this narrow-at-the-elbow preservation as the result of "membrane shrinkage." 3. The Vienna specimen of Pterodactylus (Figure 7) was traced accurately, without much membrane posterior to the elbow. 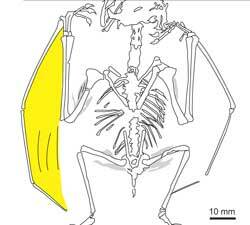 Rather than taking this example at face value (and it compares well with the Zittel wing, among others), Elgin, Hone and Frey (2011) invented the taphonomic malady “membrane shrinkage” to explain away the absence of wing membrane needed to fulfill their bat-wing paradigm. Nevermind that there was no “membrane shrinkage” elsewhere on the specimen. The Vienna specimen is animated below. It shows that if one adopts the “what you see is what you get” approach to evidence, the wing membrane extends and folds away very nicely indeed– as is! Figure 8. Bennett (2007) Anurognathus? with yellow added to show extent of wing membrane when only three wing phalanges are employed. 4. The private specimen of Anurognathus (Bennett 2007a, Figure 8 ) was employed by Elgin, Hone and Frey (2011), but they did not use gray tones to delineate what they considered wing membranes. Rather three lines indicated it. They noted that no membrane attached to the ankle, but failed to note that the trailing edge they drew extended straight to the elbow, as in the Peters (2002) model. The DGS method revealed fourth wing phalanges largely buried in the matrix beneath the left foot and right tibia, revealed here. Figure 9. 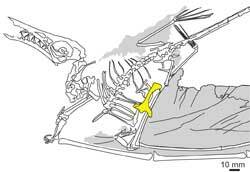 Elgin, Hone and Frey (2011) traced the wing membranes of Eosipterus, noting that no membranes were present lateral to the tibiae. Here a yellow tone completes the membrane patches and produces a complete shape that follows the Zittel wing/Peters (2002) model. 5. Elgin, Hone and Frey (2011) employed Eosipterus (Figure 9) in which they traced patches of wing membrane not realizing that when one completes the puzzle, the results support the Peters (2002) wing shape model. Again, no material was found lateral to the ankles or shins. 6. The best example of the bat-wing model has always been Sordes pilosus (Sharov 1971, Figure 10). This is the only specimen in which wing material was preserved lateral to the ankles–but there’s more to this story! 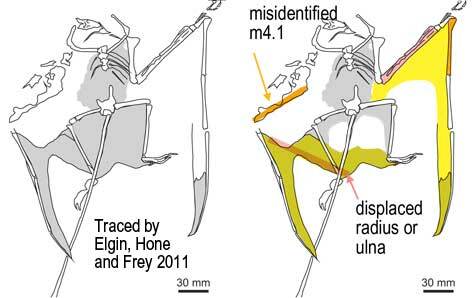 Elgin, Hone and Frey (2011) traced few details and overlooked the displaced radius (or ulna) that formed the trailing edge of their interpretation of the left wing (details here). It was indeed the left wing, but torn, displaced and preserved in such a way that the membrane continued between the ankles where it created the illusion of a uropatagium. Elgin, Hone and Frey also failed to note the continuation of the right wing trailing edge as it headed toward the metacarpophalangeal joint before turning back to the elbow and anterior femur, again as in the Peters (2002) model. Figure 10. Click to enlarge. Sordes as traced by Elgin, Hone and Frey 2011 on the left. On the right wing they failed to note the continuing trailing edge of the wing membrane that curved toward the elbow. On the left wing they failed to note the displaced radius (or ulna) that produced the illusion of a trailing edge membrane that extended to the ankle and created a false uropatagium between the ankles. These errors are highlighted in yellow, orange and pink on the right hand image. Elgin, Hone and Frey (2011) made several more mistakes when they created their reconstruction of the pterosaur wing, detailed in Figure 11. These workers, like many others before them, ignored and made excuses for clear “what you see is what you get” evidence supporting the Peters (2002) model in favor of the unsupportable, centuries-old bat-wing paradigm. Figure 11. Click to enlarge. 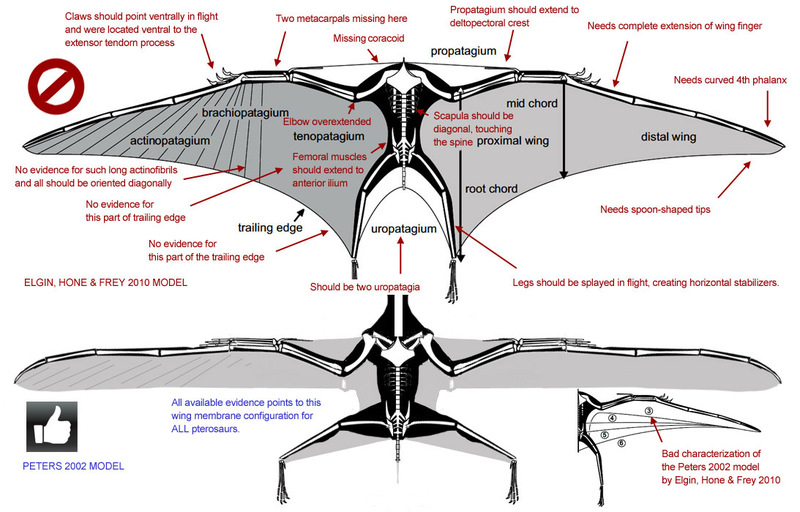 Problems with the Elgin, Hone and Frey (2011) pterosaur wing model with corrections proposed by Peters (2002). Figure 12. Click to enlarge. Elgin, Hone and Frey (2011) say these specimens suffered from "membrane shrinkage." Actually, as you can see, the wing fingers are twisted on the Rhamphorhynchus such that the membrane was preserved in front of the bones. Overlooked were the proximal membranes which are visible even in this black and white photo. The Jeholopterus? specimen has torn wing membranes. They also did not "shrink." Now for the heretical view. Peters (2002) argued for a “what you see is what you get”model and reconstructed a narrow trailing edge essentially stretched between the elbow and wing tip with a short fuselage fillet filling the gap between the elbow and mid thigh (Figures 13, 14). This wing shape is duplicated in every pterosaur in which wing material is known. Note how well it folds up to prevent damage. A deep-chord wing (at the elbow) cannot do that. Note that phalanx four either curves or is bent posteriorly, matching the curvature of the trailing edge of the tip caused by aktinofibrils separating like strips on a bamboo fan, stretching membrane between them. Note that the wing is aerodynamically taut only at full extension and that tension runs between the elbow and wing tip. The hind limb is independent. Pterosaurs originated as flapping leapers, not as gliders. Those wings developed distally first, not as gliding membranes close to the body (contra Bennett 2008). Figure 13. Click to animate. The Vienna specimen of Pterodactylus (wings folded). Animation opens the wings and legs to reveal the true shape of pterosaur wings, stretched between the elbow and wingtip with a short fuselage fillet extending from elbow to mid femur. Figure 14. Click to enlarge. The left wing of the pterosaur Arthurdactylus in dorsal view based on the Peters (2002) bird-wing model. The bird-wing model for pterosaur wings reaches its acme in ornithocheirids like Arthurdactylus (Figure 14.) Not only does this wing shape create a nice airfoil like that of a sailplane, but it folds away to virtual invisibility! There never has been evidence for any membrane lateral to the tibia. Please send any, if found. All available evidence supports the bird-wing model. Bennett SC 1987. New evidence on the tail of the pterosaur Pteranodon (Archosauria: Pterosauria). Pp. 18-23 Currie, PJ and Koster EH, eds. Fourth Symposium on Mesozoic Terrestrial Ecosystems, Short Papers. Occasional Papers of the Tyrrell Museum of Paleontology, #3. Bennett SC 2007a. A second specimen of the pterosaur Anurognathus ammoni. Paläontologische Zeitschrift 81(4):376-398. Bennett SC 2007b. Articulation and Function of the Pteroid Bone of Pterosaurs. Journal of Vertebrate Paleontology 27(4):881–891. Bennett SC 2008. 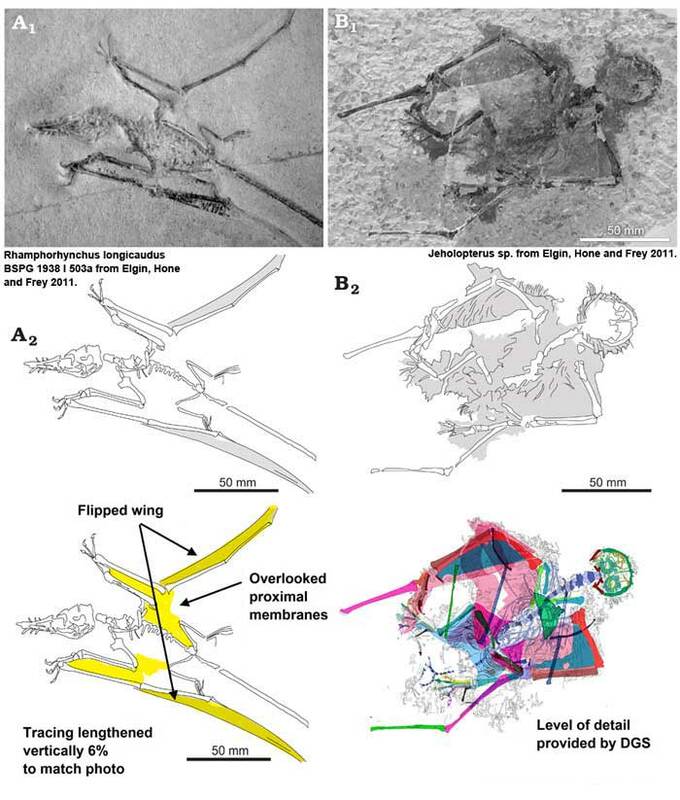 Morphological evolution of the forelimb of pterosaurs: myology and function. Pp. 127–141 in E. Buffetaut & D.W.E. Hone (eds. ), Flugsaurier: pterosaur papers in honour of Peter Wellnhofer. Zitteliana, B28. Padian K 1987. The case of the bat-winged pterosaur. In: Czerkas, S.J. and Olson, E.C., eds, Dinosaurs Past and Present (Natural History Museum of Los Angeles County/ University of Washington Press, California/Seattle) Vol. II, pp. 65–81. Padian K and RaynerJV 1993. The wings of pterosaurs. American Journal of Science 239-A, 91–166. 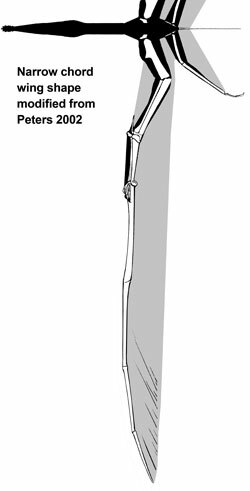 Peters D 2002. A New Model for the Evolution of the Pterosaur Wing—with a twist. Historical Biology 15:277-301. Sharov AG 1971.New flying reptiles fro the Mesozoic of Kazakhstan and Kirghizia. Trudy of the Paleontological Institute, Akademia Nauk, USSR, Moscow, 130: 104–113 [in Russian]. Unwin DM and Bakhurina NN 1994. Sordes pilosus and the nature of the pterosaur flight apparatus. Nature 371: 62-64. This entry was posted in flight, pterosaur evolution, pterosaur family tree, pterosaur wings and tagged pterosaur evolution, pterosaur wings by davidpeters1954. Bookmark the permalink. Strongly suggests???!!! I was hoping for something a little more fim. Don’t act as if you had never read a scientific paper before. “Strongly suggests” is the strongest wording most scientists ever use for anything at all. This is not an exaggeration. The beautiful, very high aspect ratio wing not only folds well, it’s extremely high aspect ratio maximizes lift and minimizes weight and drag, making them superb long distance fliers & gliders. Indeed, such matters not when it conflicts with biological reality. Life’s History (and the life-history of Her creatures) is a series of ‘imperfections and oddities’ that simply work with what they’ve got and take it to the next level. It seems David was 100% spot-on in regards to ‘narrow-chord’ wings, almost prophetically so (considering the material he worked with). Thank you for the link, Christopher. Was wondering why you did not attempt to get this into a prestigious academic publication with precise tracings clarifying objects within the amber and a phylogenetic analysis thereafter? Or is that yet to come? Still, the Pterodactylus animation above shows altogether ELASTIC wings like those of bats; wings that shrink really too much (beyond any tissue possibility, it seems) to ensure folding. Instead, those wings must have been quite rigid in the (approximately) frontback direction (just as those of birds are, due to the feathers’ rachides), and elastic in the medialdistal direction (those of birds “simulate” medialdistal elasticity by the overlapping of feathers). They must have rigid elements in them, giving them the curvature necessary to obtain LIFT, like bats’ fingers’ bones and birds’ fethears’ rachides. And obviously those elements couldn’t shrink. Any theory about the way those wings were folded should take this into account. A big shrinking of the whole membrane is far too simplistic. You were right, David. See https://www.livingamber.com/pterosaur-in-amber, “Pterosaur wing anatomy” below embryos and head crests.